Mobile Master is a powerful PIM for mobile phones and smartphones. 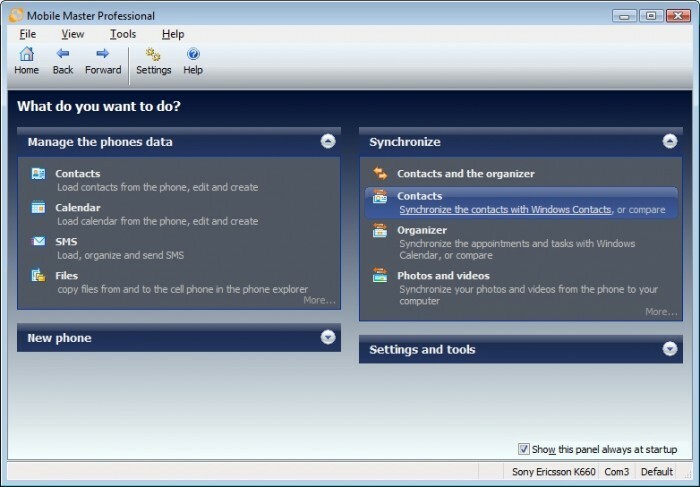 You can synchronize mobile phones (addresses and calendar) with Outlook (97-2010), Outlook Express, Windows contacts/address book, Lotus Notes, Thunderbird, Palm Desktop, Novell Groupwise Tobit David InfoCenter, Eudora, The Bat, Opera. Many filters and options. Transfer contacts from your old phone to yur new iPhone or Android handset with the included Copy Station. Or easily load, edit and save your phones address book, calendar and notes. Import contacts from: iPhone, iTunes, iCloud, Nokia (OVI/PC) Suite, Google contacts, many files, ... Browse through the phones file system and copy files. Synchronize your iTunes playlists and files or copy WinAmp playlists to the phone. Addins provide full integration in Outlook, Lotus Notes, Palm Desktop, Thunderbird and Tobit David (e.g. one button to save a contact and send it to the phone) For Sony Ericsson, Samsung, Motorola, Nokia, LG and BenQ Siemens handsets/cell phones (GSM and UMTS). More than 400 models supported. For all supported models see the homepage. Many im- and export filters. With the SMS Servant you can easily send and receive SMS (e.g. in Outlook like Emails). Copy your phone/address book from one phone to an iPhone, Android phone, Windows Phone or other cell or smart phone (e.g. from Nokia to Sony Ericsson and vice versa) Address book converter: copy contacts from e.g. Palm Desktop to Thunderbird or Novell Groupwise, etc. (without any phone required) Remote control your PC (e.g. Winamp, PowerDVD) using a Sony Ericsson phone (e.g. via Bluetooth) Remote control your PC via SMS. Address book converter to copy contacts from e.g. Lotus Notes to Thunderbird. A tool to make slideshows and screensavers. Software for data security and privacy.